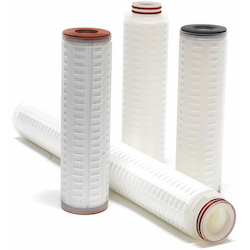 Beta 10 pleated polypropylene filter cartridges offer retention efficiency from 0.2 to 50 μ. MPN cartridges are constructed of 5.6 sq ft of media for long service life and high dirt-holding capacity. MicroVantage MPN cartridges meet applicable CFR criteria and USP Class VI Biological Test for plastics. They are made in the U.S. in a white room environment for high purity. Shelco Filters is ISO 9001:2015.